I used to have the worst trouble getting handles to line up. On anything that had paired handles--casserole, crock, cookie jar--or even a few that didn't, like batter bowls, I just couldn't get the handles lined up across from each other. I'd eye-ball and mark and attach and pull and two times out of four, the handles were closer together from one direction than the other. Drove me nuts. 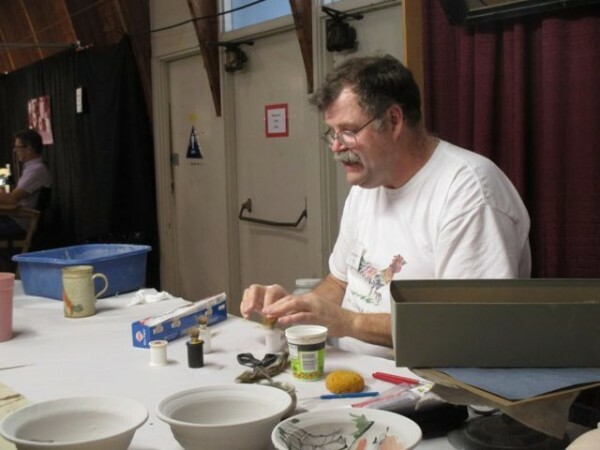 Then one year, Local Clay, our Eugene potter's group, sponsored a workshop by Ellen Currans. She's a long-time Oregon potter, founding member of the OPA, and made a lot of two-handled platters, servers, baking dishes. And she had a lovely, simple system for positioning the handles. 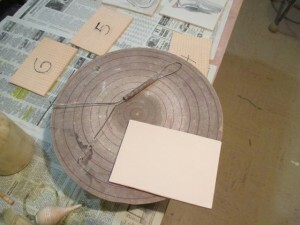 She'd make a paper template the same diameter as the pot, usually by taping the sheet to her potter's wheel and pencilling in the circle, then cutting away the excess. She'd then fold it in half, mark where fold met edge, then flatten it out and refold a couple of inches off the original fold, mark there. Putting the template over the top of the platter or dish made it easy to determine where to place the handles so they'd be exactly opposite one another. Since she was a production potter too, she had dozens of templates in all different sizes, so she always had on to match the next pot. She even made nifty little handles out of scotch tape, to make it easier to lift off the template when done. I've adopted the system wholesale, taken it a step further: I have templates on the computer that I can size and print onto card stock with the relevant diameters pre-printed. And since I have box tape in the studio, I do the handles as well. Here's a few of my handle templates, and a small covered crock about to get marked and handled. Honestly, I'm still amazed I never figured this trick out for myself. Many years ago, Saturday Market hired a marketing consultant from Portland to come down and give an off-season presentation at the WOW Hall to us artists about selling our work. The other point was Don't hide your prices. He said many artists/craftsfolk don't clearly label their prices in the mistaken idea that people will ask them, thus starting a conversation that will eventually lead to a sale. It's more likely, he says, that they'll assume the item is outside of their price range, and walk away rather than being embarrassed by asking about something that they can't afford. Show your prices, he said. Make it easy for them to get past that first hurdle. They're likely to be surprised at how reasonably priced your work is, and be more willing to talk to you about it. We took this advice to heart, and almost immediately bumped up our sales by a quarter. Meet the "shelf talker" (a term I stole from my days at the printing plant, where we made them to show prices for Heileman's Old Style). It's nothing more than a little product-and-price sign, inkjet printed on card stock and laminated with clear box tape. We have at least one for each type of pot on the shelves, two for high quantity items like soup bowls and painted mugs. For the longest time, we stuck them on with sticky poster putty, which worked great... except in spring and fall, when it was too cold to stick and needed to be peeled off the sign and rubbed vigorously between one's palms. Or in high summer, when it started to melt, leaving sticky traces behind on the shelves at the end of the day. About a year ago, I had a brainstorm: I found a source online for reasonably cheap rare earth magnets. One or two quarter-inch magnets on the back of each shelf talker and some carpet tacks nailed into the edge of each shelf make setting out the shelf talkers on Saturday mornings literally a snap. Was getting ready to (finally) make mugs this morning when I took a close look at the head of my wheel and saw something surprising: the bat pins were nearly worn away. I didn't even know this was possible. Bat pins are supposed to be forever, sturdy little bolt heads that hold your throwing bats in place. If anything is supposed to wear out, it's the holes in the bats themselves, particularly the masonite ones. They're always getting loose and wobbly; I've started sticking a sheet of old t-shirt fabric on the wheel head to keep the bats from sliding back and forth. I finally found what I needed, 3/4 inch pins with a 1/4 inch head. Cost me 86¢ for two. And the best part--almost making up for a lost morning's throwing--is that my bats don't wobble anymore. I have so many tools to put away. Round about sixteen years ago, when I started making the family room of our new-mortgaged house into a pottery studio, I knew I needed a big shelving unit, something I could slide ware boards of freshly-thrown or trimmed or drying pots on and off of easily. My studio down at Club Mud had a system made of two-by-four uprights and pipe cross-members, simple, flexible and easy to duplicate. Or so I thought. Almost immediately, I got it wrong. I put the back set of uprights right against the wall, for stability. Front set about forty-four inches out, nearly to the other end of the four-foot ware boards. Used scaffolding pipe I bought on the cheap from BRING Recycling. It worked. Sort of. The problem is balance. When you slide a ware board onto the rack, it goes in easily until just past half-way, then the front end starts to droop, more and more the further in it gets. Since the back pipe support was on the back wall, it took superhuman strength to keep the shelf from crashing down on the pots below it before it reached the next support. Clearly, a solution was needed. At the time, I had a surplus of ware boards. 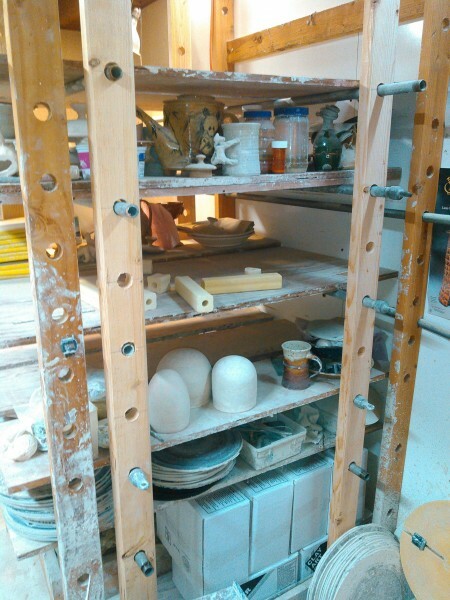 I'd bought a bunch from a potter who was closing shop, so I could just leave a set permanently mounted on the rack, slide the full boards in on top. Sure I lost 3/4" of height on each level, but I could live with that. And it's not like I'd ever run out of boards, right? Fast forward a few years. Suddenly, I've got three galleries, eight road shows, and Saturday Market is doing unexpectedly well. I'm running out of ware space, I'm running out of ware boards, I have to do something. I briefly consider replacing the base set of boards with something thinner, like 1/4" paneling, but that just seems like a Panda's Thumb solution. Fortunately, I can reverse course. My initial plan was to leave the back uprights in place, for stability, install a new set ten inches back from the front ones, then move them to the back, ten inches from the wall. This would mean no ware board would need support more than 28 inches before the next cross-pipe caught it, and I'd only have to buy hardware and two-by-fours for one more set of uprights. The more I looked at the existing ones, though, the less I liked the spacing. I'd originally placed holes 5" apart, on center, but never actually used every set, because inch-and-a-half of shelf. With pipes in every other set of holes, my basic space was 10" high. If I only needed one shelf, though, I could use the closer spacing and get twice as many dinner plates, desserts, or pie dishes. With an extra inch, though, I could fit soup bowls. And I throw a lot of soup bowls. So I went back to Jerry's for two more uprights. Drilled 32 inch-and-a-quarter holes, inhaling copious amounts of sawdust. Installed new uprights, dis-installed old ones, reusing the lag screws. (The photo shows the halfway point. Lighter colored 2x4's are the new set, darker colored ones the old.) Moved pipes into their new places, shifted shelves around, dusted, cleared fifteen years of detritus, and guess what? I have a storage system that works. Also? Sixteen extra ware boards. If only I'd done this sixteen years ago. The first day of the first pottery class I took as an undergraduate, we didn't even touch the clay. Instead, we went into the wood shop, and with scraps of wood, doweling, wire and cork, made all of our tools: cut-off wire, needle tool, throwing stick and ribs. The only tool we bought outright was an elephant-ear natural sponge, for throwing. 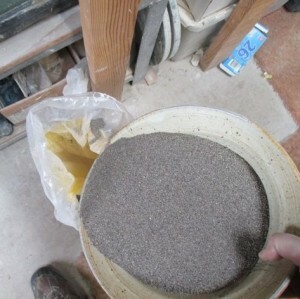 Even our chamois was recycled, previously used with charcoal in drawing class. I still carry that tradition with me. 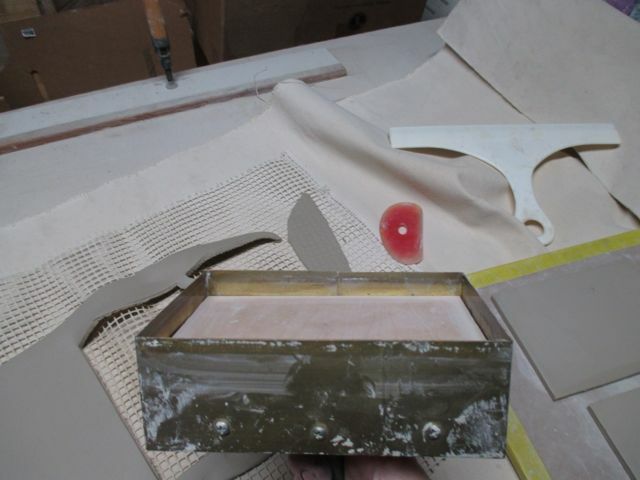 I do buy tools these days--I'm particularly fond of Mud Tools' silicon ribs--but I still use scrap wood and sheet metal and my belt sander to make many of my pottery and sculpture tools. And then there's this one. It's called a roulette, a roller. 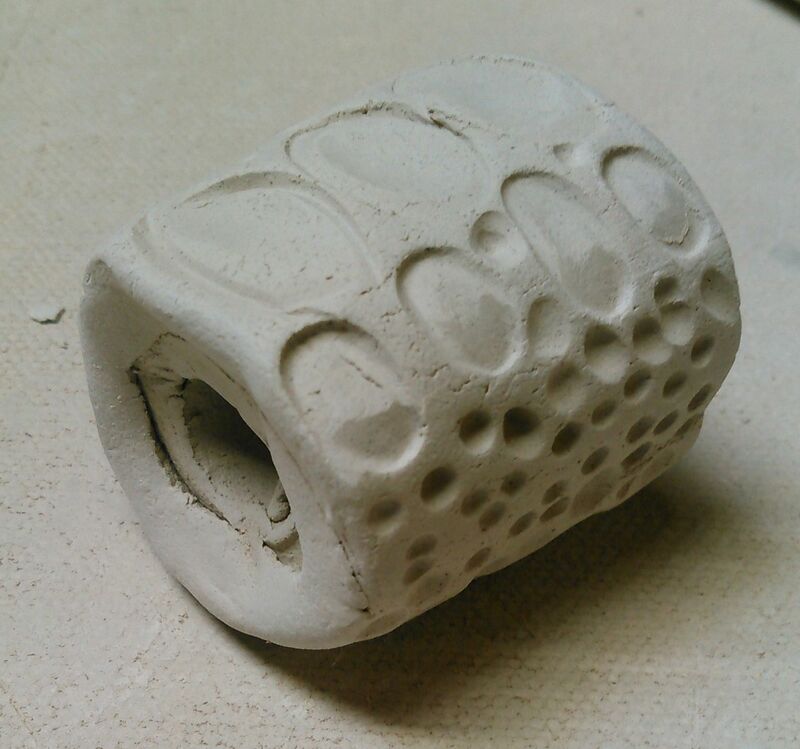 I made it from clay, pressed in tool impressions, and dried it overnight on the heater vent in the bathroom. 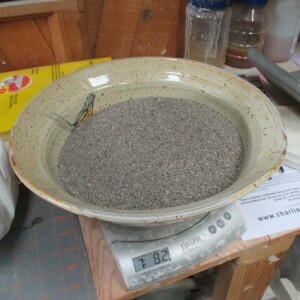 Ideally, I should have bisqued it next, but I needed it in a hurry, so I just used it as greenware. What does it do? Well, if you roll it over a semi-stiff slab, it leaves a lovely scaly texture. Like snakeskin, or alligator… or chicken legs. Yup. 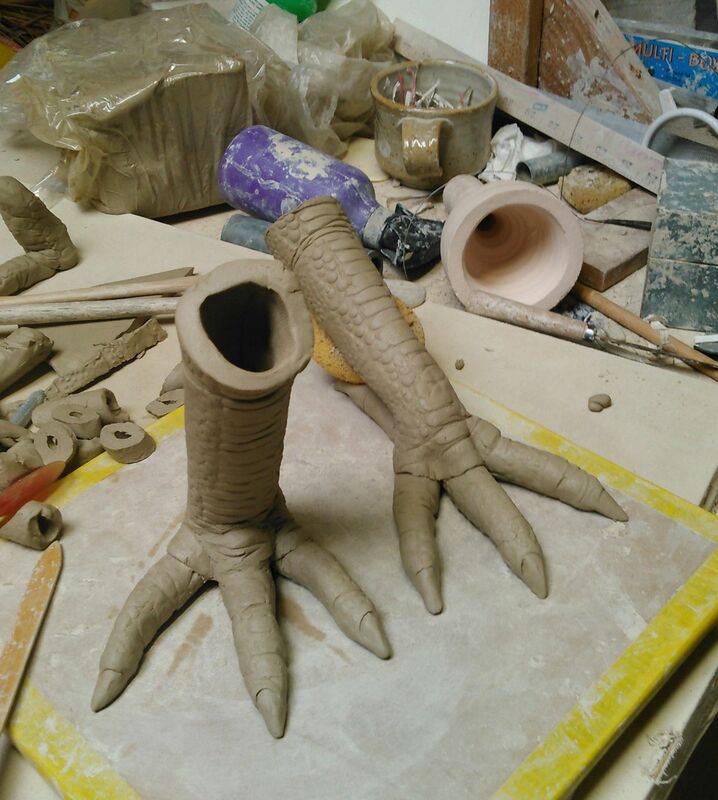 I made a special tool just so I could make chicken legs. Why? Look at my pretty new toys! 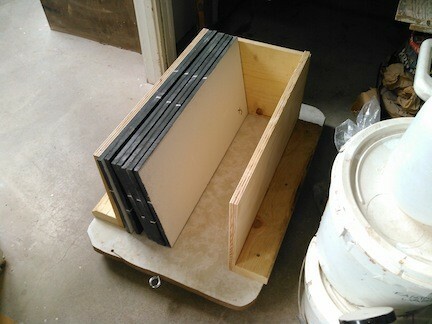 The traditional 12x24x1" mullite or high-alumina kiln shelf weighs about 20 lbs. Considering I use between forty and sixty of them in every kiln I load, there's a great incentive toward finding something lighter. These are oxide-bonded silicon carbide shelves. They're stronger, less prone to warping with use, and are only half as thick. They're a little denser, but still weigh around 13 lbs. Much easier to load, and you'd be surprised how many more pots will fit in the kiln when you knock half-an-inch off the height of each layer. Club Mud bought forty of these several years back, and several members also bought a few. With time and attrition, we decided it was time to buy twenty more for the Club; Jon King and I went in on another twenty for our own use. Here they are, brand shiny new, getting marked with iron oxide for identification. What's the mark? Depends on your perspective. It's either a capital J (with a curiously low cross-bar) or a lower case f.
To store them safely, I built a little rolling cart that will fit nicely under my ware shelves. I can hardly wait to fire them. 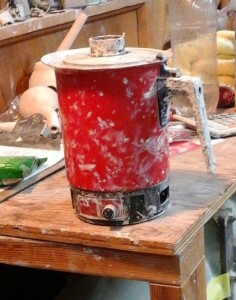 Well, after an hours warm-up, the kiln shut itself off again. Not the breaker this time; seems the kiln sitter button had popped out. Pressed the button again, and five minutes later it popped out again. Looks like the button itself is bent upwards, so the spring-loaded catch inside the sitter can't, um, catch. 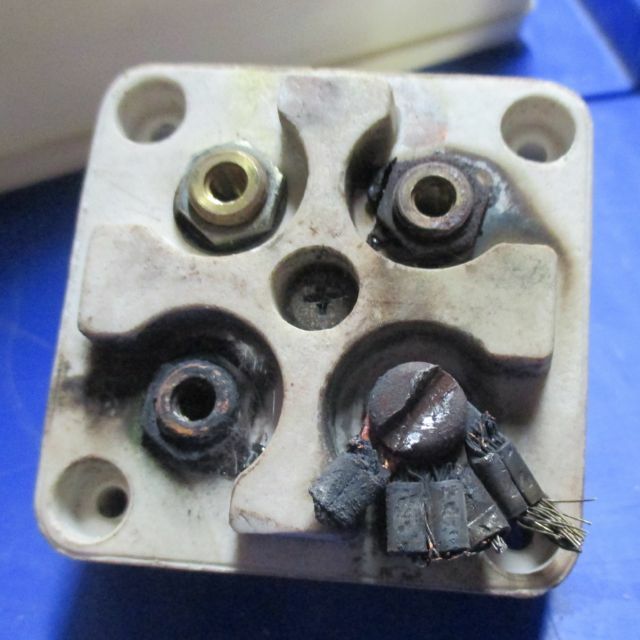 I wiggle it with a pair of pliers, and discover that the nylon button has melted and shifted on the brass center rod. Naturally, they don't sell buttons separately. 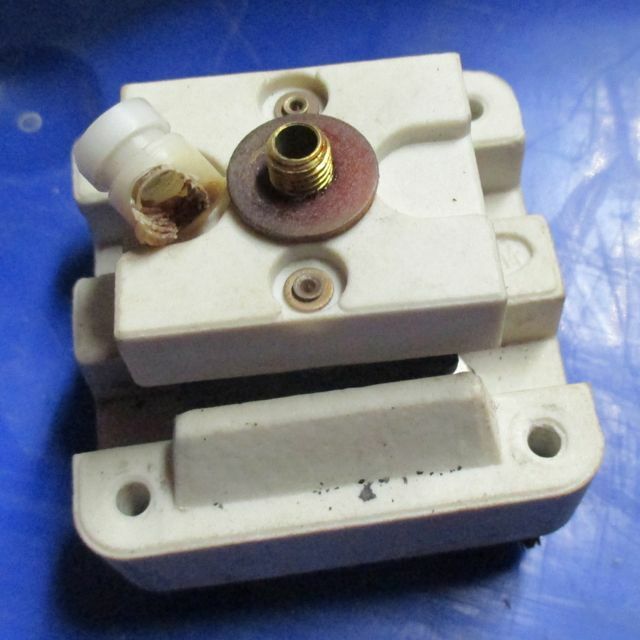 So I dismantle the box, drive down to Georgies and spend $70 on a new switch block, then spend the rest of my afternoon wrestling fused screws out of the old one. One won't come, so I clip the wires free and then replace the crimp connecters afterward. Finally, at a quarter of six, it's back together. 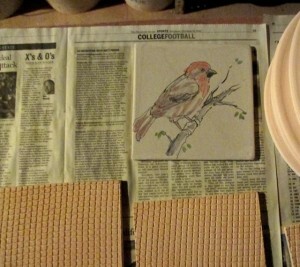 This time, I figure out a way to replace the kiln sitter cone without unloading the--still hot--kiln. I press the button to start again. Hopefully, this time it's fixed. Funny thing, though. With a new switch, the kiln doesn't buzz as it fires. I think the contacts get roughened by the arcing when the sitter shuts down, and after enough firings, they don't make good contact anymore. So they arc and buzz as the kiln fires. The new switch block contacts are perfectly smooth. No arc, no buzz. Good thing there's an indicator light, or I wouldn't even know I was firing. 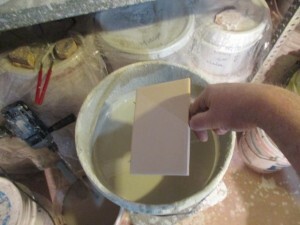 Round about half-past December, I wrote about the process of making and drying tiles. After about three weeks of slow drying, I bisque fired them, chose out the flattest ones, and brought them down to Club Mud to glaze. I actually had two tile projects, for the same customer. Six 4x6" tiles were to be lined up in a row for a sink backsplash. 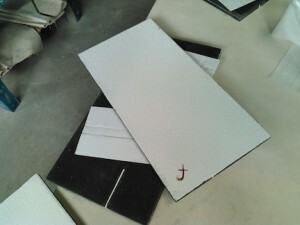 Twelve larger tiles, 6x6", were to be used in another room as accents on a commercially-tiled wall. 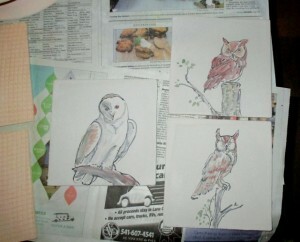 All were to be glazed and decorated with birds and animals found on the client's Lorane Valley farm. Since the backsplash tiles need to be laid in order, so the scene works properly, I start by numbering them on the back side with black stain. Then I wax all the tiles on the bottom and edges with liquid wax resist. This is kinda tedious, as the mesh-texture I pressed into the backside to hold mastic also wants to hold air bubbles, so I have to carefully dab wax resist into all the grooves, to keep the glaze out. Long ago, I rigged up a tile-holder out of a deconstructed wire whisk. Holding the tile against the wires with my left thumb, I hold it at an angle as I carefully pour a layer of glaze over the surface. 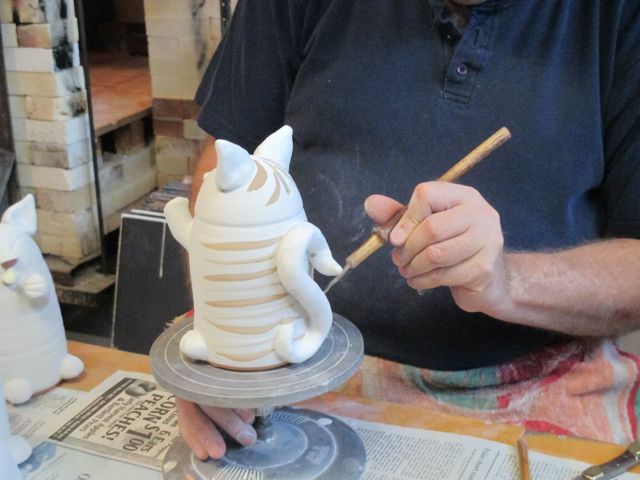 Carefully shaking it to get rid of extra glaze, I then rotate it 180° in the holder, and pour a second coat. One last shake, and I put it onto the ware board to dry. 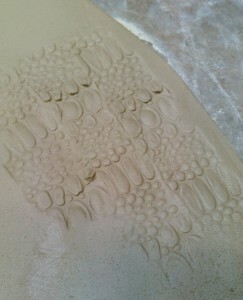 After dabbing any remaining glaze drops off the wax resist, the tile is ready to paint. 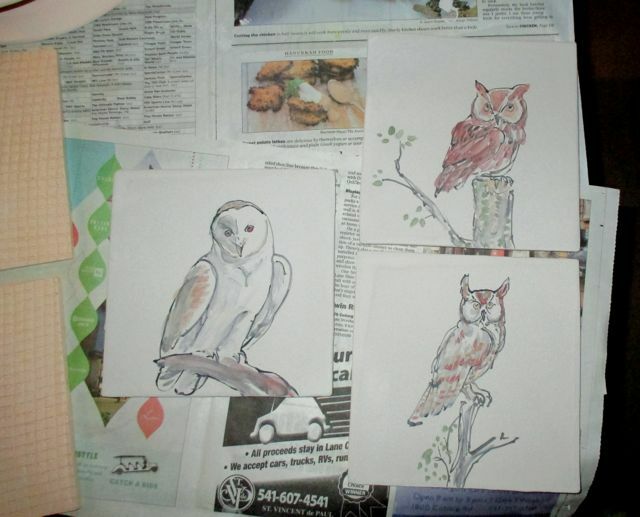 I had a generous list of birds and beasts to choose from, including house finches, downy and pileated woodpeckers, and three different varieties of owl. I ultimately did sixteen square tiles in hopes of getting twelve successful ones out of the kiln. I suspect I'll be able to sell any extras to the client; if not, I might keep them for myself. The first week of January brought sub-freezing temperatures, which disinclined me to going into the studio. The place is insulated pretty well, but the the only heat comes from an electric baseboard heater, so it takes a good while to get comfortable. Add the fact that I have to have wet hands to throw (the water is a lubricant) and it gets cold working in the studio in winter. I also don't have running water in the studio, so I bring in gallon jugs from the kitchen, and wash up in a slop bucket that sits on the concrete floor getting frigid. I really shouldn't complain, though. 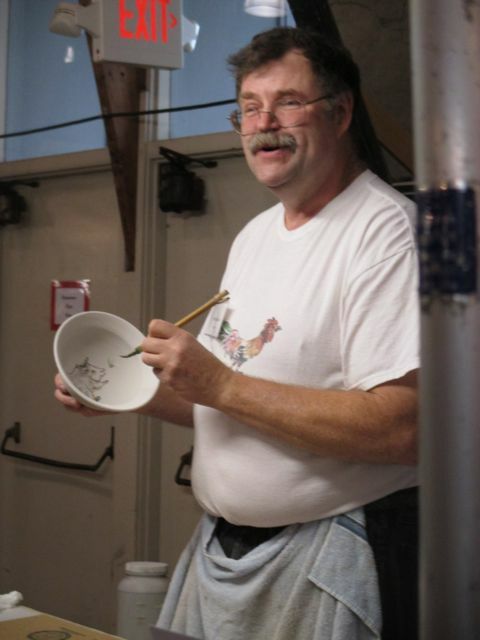 My professor back in the midwest used to bring a kettle of hot water down to the studio, where he'd have to break the ice on his throwing bucket and pour the water in before beginning his work day. I've gone him one better. I picked up this little electric hot pot at Goodwill for five bucks. One potful is just enough to bring the cold water in my throwing bucket up to cozy warm and ready to throw. I used to lay out and cut tiles with a ruler and square, or a foam-core template; then I got a commission for a full kitchen backsplash/surround, 21 linear feet of 4x6" tiles. I priced a few commercial tile cutters, but decided it would be cheaper by far to make my own. This is my punch cutter. It's made from sheet brass, folded and screwed to a base plate of 1" sub-flooring. 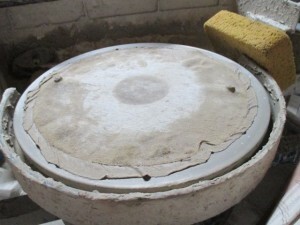 There's a spring-loaded plunger made of metal conduit that presses a piece of half-inch plywood inside the die against the clay, popping the finished tile out onto a square of drywall. There are some ceramic processes that require flat sheets of clay: tile-making, certain press-molds, slab building. 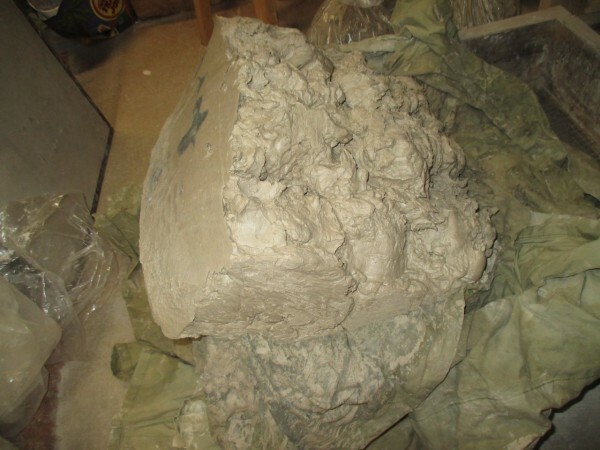 There's lots of ways to produce flat clay. You can cut slabs from a block of clay with wire and a couple strips of plywood. 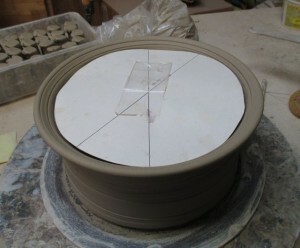 You can throw it against the tabletop at the correct angle and stretch out your slabs. You can even commandeer your grandma's rolling pin, if you promise to get it really clean afterward. 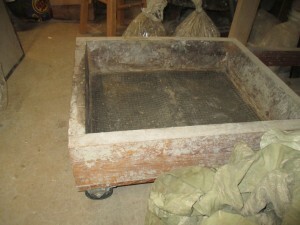 This is a slab roller. 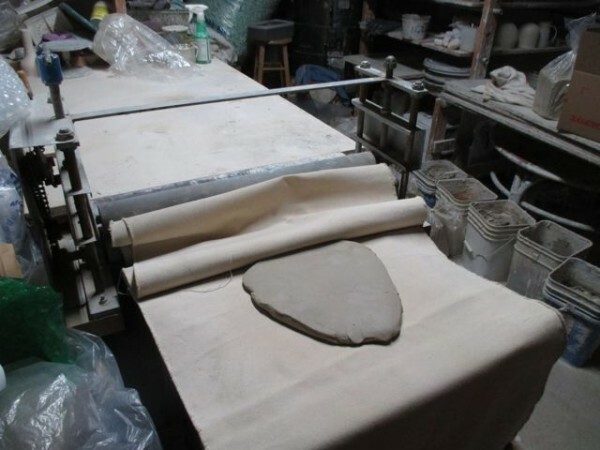 It's a sort of mechanized rolling pin for producing flat sheets--slabs--of clay. Actually, it's two rolling pins, rigged with crank (not seen, off the right edge), gear and chain to counter-rotate and pull the clay--sandwiched between sheets of canvas, to prevent sticking--through the rollers and out onto the table on the other side. 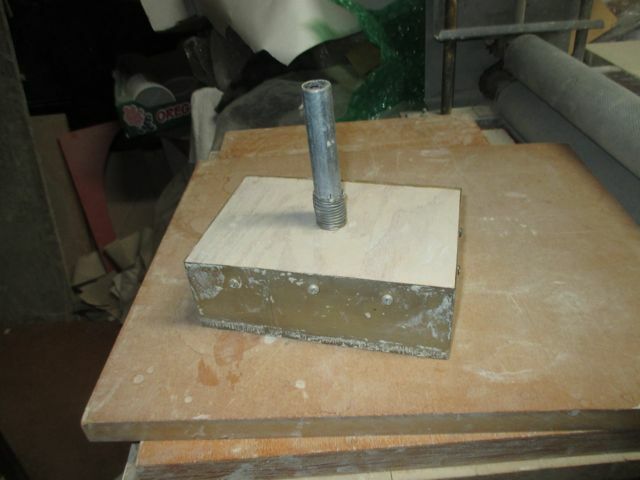 There's a set screw on each end of the top roller, to adjust the thickness of the slab to be rolled. If you're rolling from very thick to very thin, you'll do it in steps, rolling a slab, lowering the top roller, running it through again. 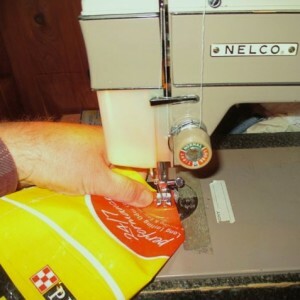 Anyone who's made their own pasta will recognize the procedure. You'll also need to periodically rotate, flip or change the canvas, as it'll start to stick to the clay if it gets too wet. 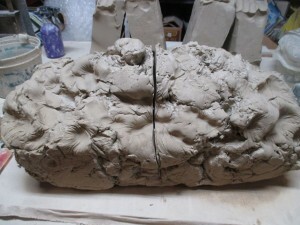 I used to do a lot of slab-built sculpture, for which the slab-roller was hugely helpful. Lately, I use it mostly for oval platter bottoms and tile projects, though I still hope to get back into sculpting sometime this winter. Got a head-start on glazing for my Fall Festival/Clay Fest firing on Sunday, doing incense dragons and kitty banks. I'm down to one of the latter, so will have many going in this load, some with cobalt blue stripes, others, like this one, rutile gold. By the way the device it's sitting on is a banding wheel. It's a little fingertip-driven turning device to spin your pot while you paint bands or stripes of color. I also use it to paint the cobalt lines on my French butter dishes, but mostly to apply wax resist to the bottoms of bowls and plates. 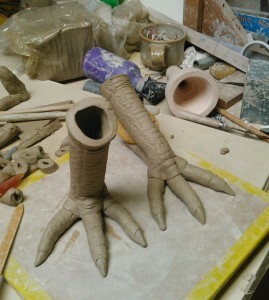 In the studio again, trying to get back into throwing mode, and muttering curses at my throwing bats. They're old and worn, and the holes that fit over the pins in the wheel head are too big. 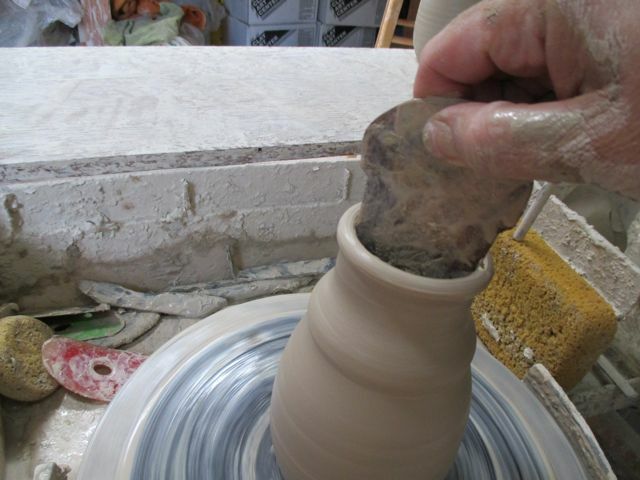 The bats stay more or less in place while centering, but slide back and forth as I open the pot or try to bring up the walls. With extra attention to the exact position of the bat, it's manageable, but when I'm trying to make four dozen soup bowls, I'd rather not have the distraction. 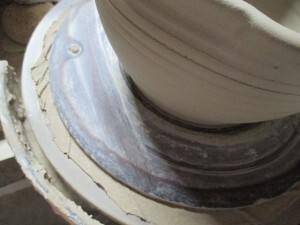 Putting water on the wheel head under the bat to create suction between bat and wheel head helps a little, but try centering a big lump of clay and once again you're skidding all over the place. There's actually a tool you can buy, a thin foam pad that goes under the bat, but they don't last terribly long, from what I've heard, and face it, I'm too cheap to buy one. Somewhere along the fourth or fifth bowl, I had an idea. Denise has been culling my t-shirt drawer this week, so I pulled one out of the rag bag. Traced a circle onto the back from a throwing bat, and cut it out. 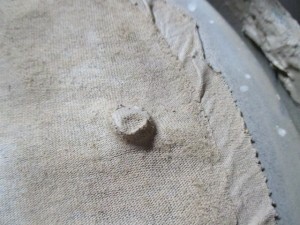 Wet the cloth, squeezed out the excess water, and stretched it over the wheel head, right over the bat pins as well. Once I put on the bat, suction, friction, maybe even a little extra cloth packed into the pin holes means the bat stays fast while I center and throw my soup bowls. It's a little harder when I have to lift pots off on bats, because the cloth wants to come too, and I have to keep unrolling and repositioning it. Maybe I should cut a bigger disk with some elastic, or a drawstring. Maybe that's too much work. But meanwhile, my bats are staying put. It's been a while since I've done a Favorite Tools post, and as I was throwing piggy banks last week, I thought I'd show off this little gem. When I first tried making banks, the results were pretty random. It was while I was in La Crosse, working evenings and weekends out of the Viterbo ceramics shop, just out of college. 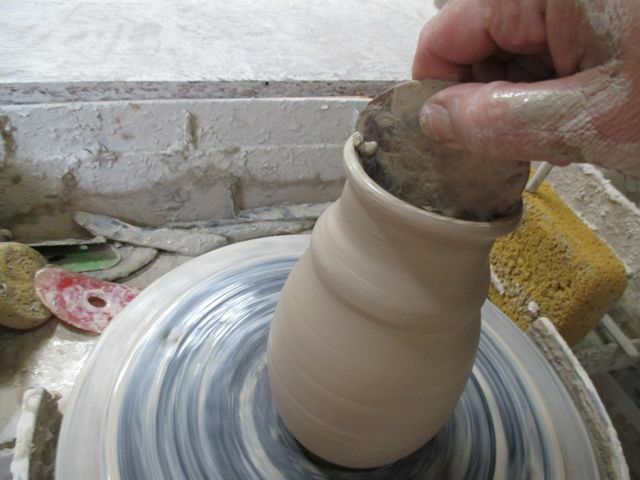 I'd finally mastered centering, and was getting more-or-less the pots I was aiming to throw, but consistent? Matching size, shape? Not so much. When I tried to make old-fashioned piggy banks, with the cork in the mouth, I wound up taking them all down to the craft supply store, matching corks to mouths as best as I could. In at least one case, I ended up cutting a cork down to the proper size and taper on a band saw (with tilting table to get the taper). In retrospect, I'm amazed I still have ten fingers. 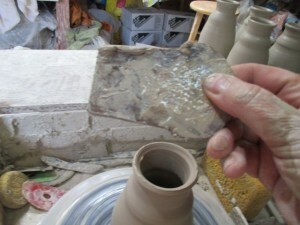 Years later, working for Slippery Bank Pottery, I learned a better way. Will hired me specifically to throw hummingbird feeders for him, to meet a catalog order, nine dozen a week. They're basically bottles with that hang mouth-down from a loop handle, with a stopper and glass tube in the mouth. Because the stoppers were bought one size in quantity, the bottle mouths all had to be the same size and taper. The trick is to throw the neck of the pot a little smaller than the finished size, then, with the wheel turning, introduce a key-shaped template into the mouth. It's the same taper as the cork, sized to account for shrinkage, and it slides in and stretches the opening until the shoulder of the key butts up against the lip. Simple, quick, consistent and reliable. I haven't made a hummingbird feeder in years, but I think that key template is still down in the bottom of my tool box. And when I started making piggy banks, I just sized up the tool to the proper size. I traced the cross-section of the cork, scaled it up 13%, and transferred the shape onto scrap of sheet metal. Cut it out with a jeweler's saw, filed off the rough edges, and presto! Piggy's mouth is ready to accept a #28 cork. Just heard from Saturday Market that the local fire marshall's decreed that tent-style booths (of which ours is one) will need to have a minimum of 30 lbs. anchoring weight for each leg. 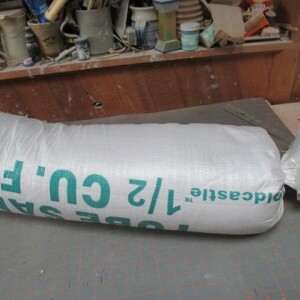 The Market has commissioned a local canvas supplier to sew custom sand bags, but I'd rather do my own. 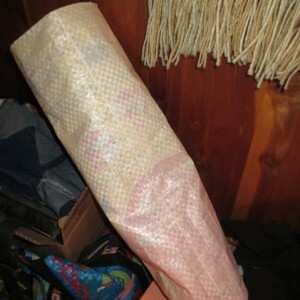 We already have sand-bag booth weights, but they only weigh 15 lbs. each, so I thought I'd just make another set. 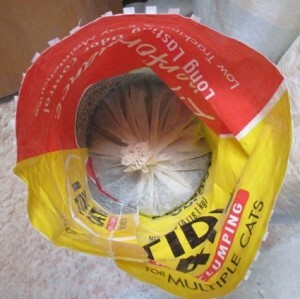 I start with a couple of empty cat litter bags, from 40 lb.-size Tidy Cat. 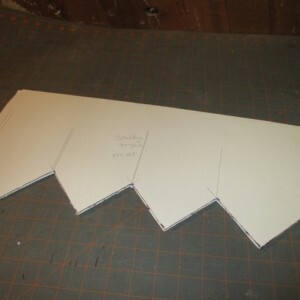 I cut each one in two, then trim the pieces down to 24" lengths (width is 18.5"). 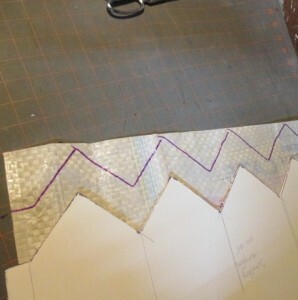 With a template, I transfer measurements to the end of each piece, then cut out the notches. 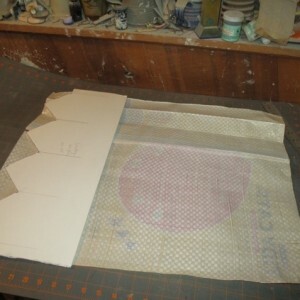 Each side is 4.25" wide, leaving around 5/8" for the side seam. Sewing the things takes practice. The sewing machine's feed dogs don't want to grip the slippery material. 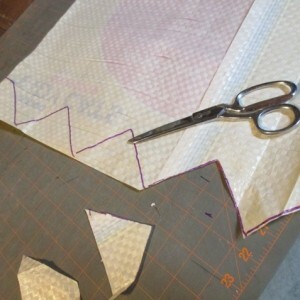 Sew the side seam first, then the two outer seams from the bottom. 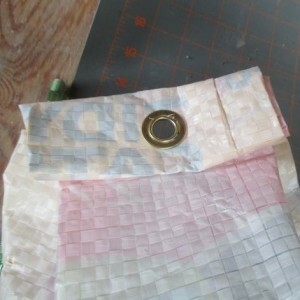 Flatten the bag on the other axis to line up the last two seams, and stitch them. 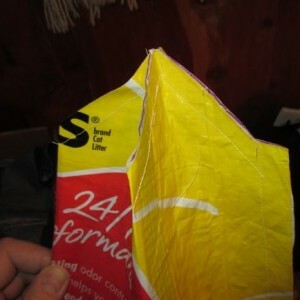 Turn the bag inside out. Cinch off the top with a zip tie, trim off the tie and the top of the inner bag. 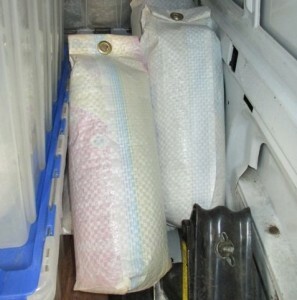 Fold over the top and secure with a grommet. Two bags per leg will meet the fire marshall's requirements. Since I already had four bags made, my total cost for an additional four: $3.98 for the sand, $4.99 for grommets. Sometimes the best ideas are the simplest. Things that make you slap your forehead and say Why didn't I think of that? I struggled literally years with placing handles. 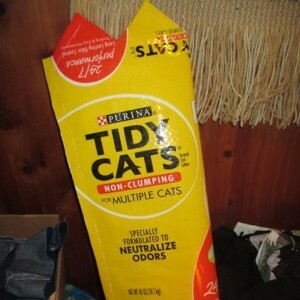 I'd eyeball, I'd measure, I'd attach the lug handles… and they never lined up properly. Always closer on one side of the pot than the other. Pitcher handles ended up twisted to one side or the other of the midline. Teapot handles never lined up with the spout. Drove me nuts. Then I took a workshop from veteran potter Ellen Currans. She'd been a full-time potter for longer than I'd been alive, and had dozens of clever tips and shortcuts. The one that I use most often is her handle placement guides. She was making handled platters, press-molded from thrift-store platters (using WD-40 as a mold release--another clever notion), thus had to measure and place dozens of handles in an ordinary production run. So she cut out a circle the diameter of her platter. Folded it in half, and marked where the fold hit the circumference. Flattened it out, folded again rotated about 15°, marked the edges. Made a little handle in the middle from sticky tape. Then all she had to do was drop it on the platter, transfer the marks to the rim, and lift it off again. Like I said, brilliantly simple. I've probably got a dozen of them by now, sized from honey-jar top (also used on large pitchers and teapots) up to large-covered casseroles. I make them up on the computer, print them on card stock, cut them out and attach a tab handle from box tape. And I don't have to squint across the top of the pot anymore. Since I've already gotten one kiln-load done this winter, I'm taking the time to do some more labor-intensive pots for my current production run. I've already talked about oval platters; I also need to catch up on colanders. I basically start with a medium serving bowl, 4.5 lbs. of clay. I trim on the dry side of leather hard, then, while still on the wheel head, scribe shallow guidelines into the surface. I cut three notches in the foot ring so water won't be trapped under the pot, and with my nifty cutting tool and a lot of patience, drill dozens of holes in a pretty six-point star pattern. I love this hole cutter. It's so simple. You take a cheap plastic pen holder and an india ink nib, and you reverse the nib. Put the point into the pen holder, so the sturdy, blunt end sticks out. Push into your pot, twist, and you get a perfect hole. 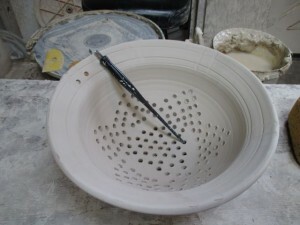 And because the nib is only half a cylinder, it's easy to pop out the clay plug one-handed before making the next hole. I'll lightly sand the inner surface with a green ScotchBrite pad once it's dry. Have to be careful, though. With all the holes, a green-ware colander is much more fragile than the comparable serving bowl.